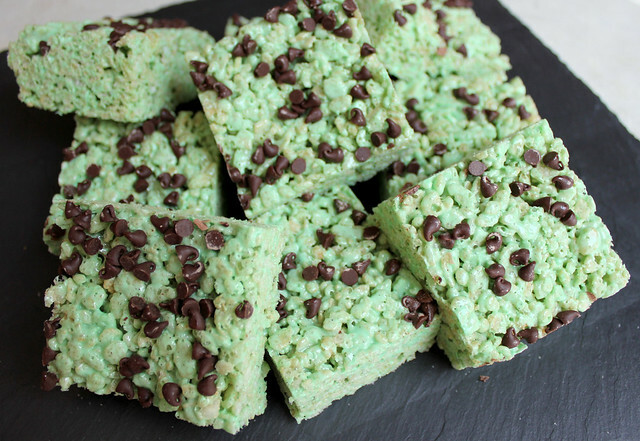 Old fashioned rice krispy treats are hard to beat, but sometimes I cannot leave well enough alone. My recipe is made with browned butter and a pinch of salt, but everything else is pretty much the same as the traditional recipe. Oh, I also added mini chocolate chips to the top because how could that hurt? Browning the butter before adding it to the marshmallows gives the treats a nutty and rich flavor. It is subtle, but you can definitely tell the difference. I love this version. Brown butter does magical things to simple recipes. 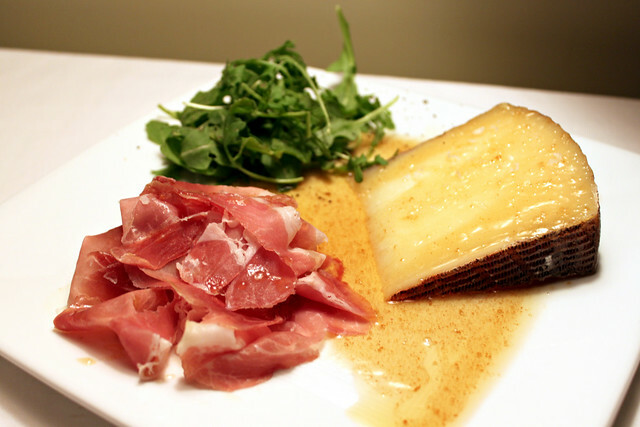 One of my all-time favorite appetizers is manchego with brown butter honey sauce. Yum. 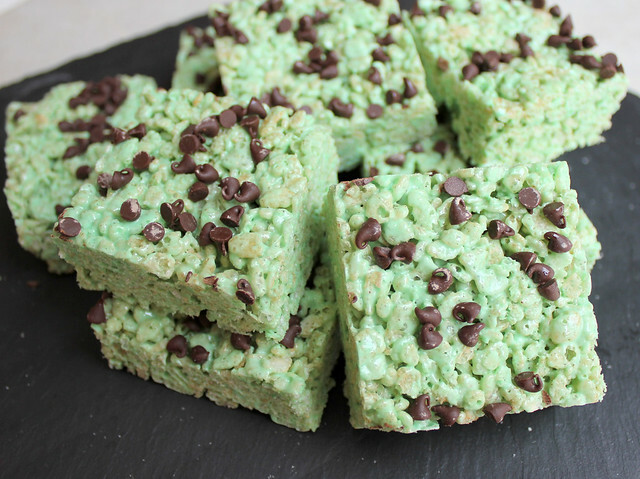 So you may have noticed the rice krispy treats are green. That was on purpose, not a kitchen experiment gone wrong. I wanted to do something festive for St. Patrick’s Day. 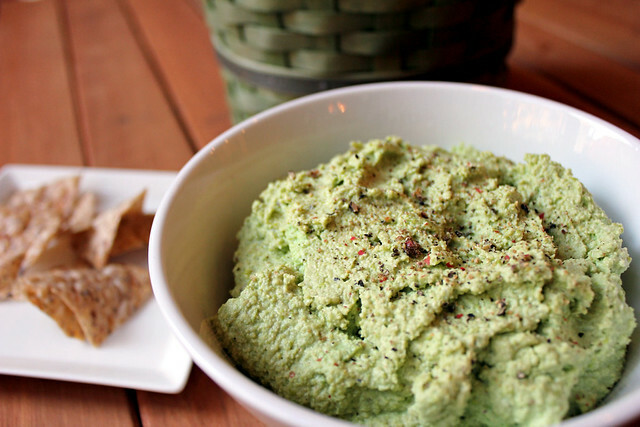 Last year I made green edamame hummus, which was a hit at the St. Paddy’s party I attended. Of course, you can always leave the food coloring out or change it up for a different event. I will be celebrating with family again this St. Patrick’s Day, but I don’t think we will be as lucky as last year with the weather. I will never forget that day. Not only did we have a great time but it was 80+ degrees in Chicago and the trees were budding. This year….. not so much. Oh well, we know spring is coming! Grease a 9x13 inch pan with cooking spray. Melt the butter in a small saucepan over medium-low heat, start whisking as it melts. The butter will foam up (continue to whisk) then turn a golden color with specks on the bottom of the pan. Continue to whisk until it is brown in color and starts to smell nutty. Be careful to not burn the butter. Place the mini marshmallows in a large, microwave-safe, bowl. Pour the butter over the mini marshmallows and stir with a spatula. Add the pinch of salt and food coloring, if using. If the marshmallows do not melt from the heat of the butter, microwave in 30 second intervals until completely melted and smooth. Stir in the rice cereal until evenly coated. Pour the mixture into the greased pan and pat down with the spatula or waxed paper. Scatter the mini chocolate chips over the top. This looks so colourful. My kids will love them I should give a try to this since its simple as well.